So the FBU have called off their Bonfire Night strike. But their dispute rumbles on, unresolved albeit with an improved offer from the London Fire Brigade. There could yet be another strike. And that could set the scene for major co-ordinated action. Charles Adje, GMB branch secretary for LFEPA, said: “We will be co-ordinating the ballot [with Unison]. 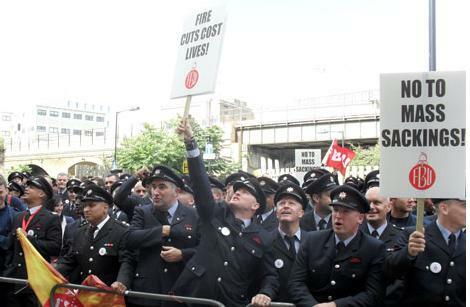 If the FBU wants to work with us, we are happy to work with them.” Unison branch secretary Tony Philips said: “If the FBU are in dispute, we’ll definitely have action with them.” Both unions have voted to strike in consultative ballots in the last two months. LFEPA has decided to pay redundant staff a week’s pay per year served, instead of mutiplying the total sum by three as previously. The unions believe redundancy terms cannot be changed without new contracts. A spokesman for LFEPA said they had not been notified of any strike ballot and declined to comment on redundancy pay. Even if the FBU doesn’t strike again, this would seem to be the biggest co-ordinated strike in the country since the coalition took power. In fact London is a veritable hotbed of public sector union agitation at the moment. Outside LFEPA, there isn’t a lot of actual, deliberate co-ordination going on, but watch this space. How to protest: Bananaman or Brendan Barber? The TUC Congress in Manchester kicks off today with the unions united in their opposition to government cuts. True indeed, but not the whole truth. There is, quite understandably, a wide variety of opinion on how this is to be done. Delegates will this morning endorse a motion supported by nine major unions calling on the TUC to “support and co-ordinate joint union industrial action, nationally and locally” in opposition to public sector cuts. But what does that mean? Does it mean the TUC working in a back office role to actually timetable demonstrations and strikes? Asked by Tribune, TUC general secretary Brendan Barber said he does similar things all the time: “We do co-ordinate action”. But there has not been a properly co-ordinated plan of industrial action by multiple unions since the revolt over public sector pensions in 2005. Since then, repeated TUC congresses have discussed joint action – with little result. The RMT’s Bob Crow says he is very keen to take joint industrial action with other unions. Speaking to journalists yesterday, he said: “If people in the civil service or Royal Mail or police are taking action, my view is to link up together because otherwise we’ll be picked off one by one.” But he rejected the notion of forming formal alliances with unions to do this. Mark Serwotka at the Public and Commercial Services Union is very keen on alliances, however: not only is his union signing a detailed formal agreement with Unison for joint working this week, but PCS has also written to other unions to offer alliances with them. Tony Woodley at Unite, they say, was “very positive”. There’s another question. Should trade unionists engage in “civil disobedience”, resisting the government on the streets and perhaps risking arrest? Bob Crow thinks so he called for “a campaign of civil disobedience going on the streets defending ourselves. It could be anything from Bananaman going up No 10 to Spiderman going up Buckingham Palace”. Meetings, meetings, meetings. Unions large and small are currently meeting, with each other and internally, to decide on what motions they’re going to back at this year’s TUC Congress in Manchester. There’s a raft of motions up for debate which call for varying degrees of campaigning and co-ordinated action to defend against public sector job, pay and pension cuts. It’s one thing to propose a motion to the TUC. It’s another to get that motion passed. It’s yet another – if it does pass – to do something substantial to put that motion into effect. The “day of action” on October 20 called for in one of the motions – which led the Times to talk of an autumn of strikes – cannot be a strike, because you need to hold a ballot to call a strike. And because unions have to give lots of notice to bosses for strike ballots and their results, it’s safe to say that an autumn of strikes is now looking near-impossible. They would have to agree joint strike action at Congress (no motion calls for strike action as such), then plan strikes, give notice of ballots, hold ballots, get yes votes, give notice again… you get the idea. And sometimes there are upsets. In September 2008, as I reported at the time, the Prison Officers’ Association pushed an amendment that would change a vote for “joint action” to “joint strike action”. It failed to go through, after the Unite delegates voted for the amendment by a show of hands, Dave Prentis in the chair called a card vote, and they then “lost” their voting cards. The POA general secretary said Prentis should “get new glasses”. The Public and Commercial Services Union, the GMB, RMT and Unison have all put up motions against the cuts. Those motions will almost certainly be composited together into one in the next few days. How strong the motion is and how much support it’ll get remains to be seen. However, the FT is already reporting that the TUC’s general council is going for a day of protests in March next year, rather than October. The PCS union, which tends to take a hard line and favour joint action where possible – is pressing ahead with protests on October 20 and 23. Another year, another TUC, another spate of motions calling for action. We’ve been here before (as I wrote two years ago). There hasn’t been solid joint industrial action in the UK in defence of jobs, pay or pensions for a few years. Of course this year is different – there are Tories in power and big cuts on their way – but wait and see. Shocking stuff just in from the GMB union: Workers on engineering construction sites have rejected the new pay and conditions offer put to them by their union shop stewards just a few weeks ago (which I wrote about below at the time). This means that those 30,000 workers think they deserve a better deal from the employers – and are prepared to strike, officially or unofficially, to get it. The union bosses though it was a good deal, and told me so. A pay rise scheduled to be above inflation, increased rights for union officials to instigate grievance proceedings, and a promise to pre-audit companies to make sure they were prepared to pay according to the national rate. “We’ve got what we want on auditing”, said GMB national secretary Phil Davies, one of the union negotiators. GMB and Unite shop stewards agreed. Judging by the GMB press release put out this morning, part of which appears below, the workers aren’t happy at the lack of a promise to have an unemployed workers’ register to use to fill vacancies – the employers only promised them a working party to look at it, as I recall. Phil Davies GMB National Secretary said “The members want more progress on the skills and unemployment registers and they want to copper-fasten the pre award audit to screen out employers who plan to undercut the agreed rates and terms and conditions. “The employer’s offer of working parties on the registers is seen as jam tomorrow and the members no longer trust the employers to deliver. Lo and behold, I was right. A motion to the TUC congress (too long to copy and paste here; have a look at motion p49 on the draft agenda if you’re interested) from the PCS is callng on unions, under the leadership of the TUC, to band together in support of “protection of public services and an end to privatisation; ending the systematic tax evasion by corporations and the current tax privileges of the wealthy; opposing wage cuts” and more. I don’t think it will lead to anything much. At last year’s TUC there was a strong motion passed on co-ordinated strike action against low pay which came to nothing. The year before there was another motion passed on co-ordinated action (the word ‘strike’ did not appear). Again, nothing. The PCS is keen to link up with other unions; other unions less so. This isn’t really about ideology. What’s being demanded here is not revolutionary socialism. It’s closer to Labour party policy circa 1994 when John Smith died and the age of New Labour was ushered in. As far as privatisation goes, Unison are with them on that one; but they’ve never shown any willingness to link up with the PCS over it. Rivalry and suspicion between unions is likely to be factor, as is fear among Unite, Unison and other Labour-affiliated unions of damaging a Labour government. The Prison Officers’ Association’s rejection of the Ministry of Justice’s modernisation plans will worry Jack Straw. The POA and its general secretary Brian Caton are nothing if not militant. At last year’s TUC congress, a vote was held on holding coordinated strike action across unions. I wasn’t in the hall at the time, but I’m told that on a show of hands the ayes had it. But Unison general secretary Dave Prentis in the chair, no fan of general strikes, denied there was a clear result and called for a card vote, whereupon the Unite members suddenly ‘mislaid’ their cards and the vote was lost. Caton’s response? Prentis should “get new glasses”. The POA also put forward a vote calling for an actual general strike, which didn’t get even that far. So if the POA have rejected a pay-and-modernisation offer, it’s likely they’ll want to make trouble over it. The BBC and the Daily Mail jumped on the angle of fitness tests for officers, but in reality this is a much bigger argument over a) whether Straw’s carrot of a promised £50 million cash injection for extra pay in 2009-10 is worth the modernisation hoops that officers will have to jump through, and b) whether (as the POA says) the prison service is being cut to the bone anbd the plans will see staffing numbers fall and the best-trained staff going to the wall – even as the government wheels out its titan prisons. Strike action by prison officers was made illegal last year. But in 2007, prison officers took unofficial strike action, and the recent nationwide wildcat strikes will no doubt have emboldened the union. Despite the sensitive role of prison officers, the POA’s militancy has traditionally meant it’s more likely to take a hard line with government that most other civil service unions. Put simply, if the POA’s members don’t take unofficial action (suitably disowned by their leadership, of course) I’ll be surprised. In my last post but one, I suggested that one reason for the wildcat strikes was that there is work to go round and money to be had – it’s just not being offered to British workers. “The current economic climate, widely publicised as the credit crunch, has caused some economic and industry commentators to question whether the robust growth that the UK construction industry has enjoyed in recent years will continue. “In considering this we should be mindful of a number of objective facts. For example, it is worth noting that whilst the total volume of construction output fell by 0.5% between the first and second quarter of 2008, new infrastructure output grew by 7% over the same period. In addition it is worth noting that the latest Construction Skills Network Report forecasts that the infrastructure sector will experience the largest growth through to 2012, averaging 5.8% each year from 2008 to 2012. “Whilst it is true that no one is currently in a situation to predict the medium term effect that the current economic slowdown will have on the UK construction industry as a whole, there a number of infrastructure projects and policy decisions that will ensure long term growth in the engineering construction sector. Further proof, then, that the jobs are not only there, but they’ll stay there. In the circumstances, this dispute could run into next year in some shape or form. If the government is minded to take action in support of B****** j*bs for B***** workers, it will probably require European legislation, which would take years to draft, agree and enact. And if not, expect more trouble ahead. The following quote is from BearFacts.com, a message board for construction workers with strong links to the action. I should point out that it does not seem to be representative of views on the website as a whole.